The bulk cement trailer is normlly used in powder cargo transportation such as cement, mineral powder, ashes, flour, and other powder with diameter less than 0.1mm. The powder is discharged by compressed air generated by the air compressor. The tanker shell is specially desgined to bear the large air pressure. The tank design helps to shorten the discharge time and reduce the residual during unloading. 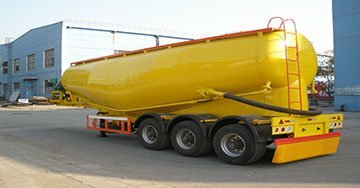 As other types of the tanker trailer, there are various options for tanker size, in which 36CMB is the most preferred, the thickness of tanker is 6mm. The air compressor, powered by PTO or separated engine, adopts Honda or other brands the customer named. The same as all other type of tanker trailer, it's difficult to load bulk cement trailer inside a 40ft container. CBU is the only way of shipment, the freight cost will occupy a large amount in the total cost of the purchasing of bulk cement trailer.